Winter Harbor, on the west side of the Schoodic Peninsula, near the entrance to Frenchman Bay, was long a favorite safe harbor for mariners seeking shelter from storms. After a congressional appropriation of $4,500 in August 1854, a lighthouse was built on the southern point of little (about four acres, depending on the tide) Mark Island to guide vessels into the harbor and to warn of dangerous ledges nearby. 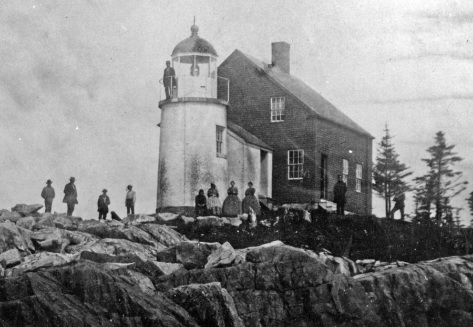 The Lighthouse Board announced in June 1856 that a fixed white light would be shown from a fifth-order Fresnel lens, atop a white cylindrical brick tower, 37 feet above high water. The lighthouse went into service on January 1, 1857. Attached to the tower was a wood-frame, one-and-one-half-story keeper’s dwelling, painted brown. For many years, the station also had a fog bell with automatic striking machinery. The first keeper was Frederick Gerrish, whose father, Andrew Gerrish, was one of the early settlers of the community of Winter Harbor. Right: Benjamin Maddox was keeper of Winter Harbor Light 1888-96. Photo courtesy of Merridee Marcus. Frederick Gerrish lived at the lighthouse with his wife, Susan (Hammond), and their eight children. Nathan Wasgatt succeeded Gerrish as keeper in 1861. 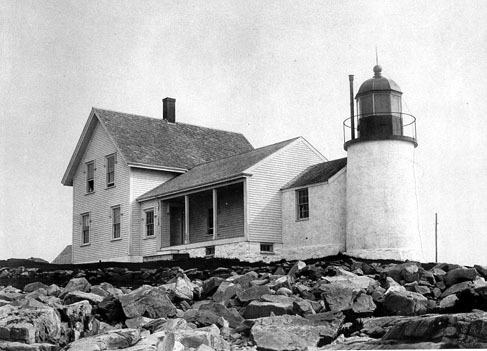 Although it was located almost a mile offshore and access was sometimes difficult, the island was considered a pleasant family light station. In its 76 years of active service, only nine keepers and their families lived on Mark Island. The longest tenure was that of Adelbert C. Leighton of Steuben, Maine, who served from 1896 to about 1927. The Lighthouse Board reported that the station was “in good repair” in 1869, but just seven years later it was announced that the dwelling was “decayed past repair.” A new wood-frame, one-and-one-half-story house was constructed in 1876, just north of the original dwelling. A boathouse, 12 by 20 feet, was added built in 1878, and an oil house was added to the station in 1905. In August 1933, the light was discontinued and replaced by a lighted buoy to the southeast. The last keeper was Lester Leighton. In 1934, George Harmon of Bar Harbor bought the property at auction for $552. Three years later, Bernice Richmond, a writer and musician, and her husband, Reginald Robinson, a sociologist, bought the island from Harmon for $2,000. Richmond, originally from Livermore Falls, Maine, had sailed many times as a girl to Halfway Rock in Casco Bay. She had visited the keepers there and witnessed raging seas break around the tower. “That is why I wanted a lighthouse of my own,” she wrote. Richmond wrote two books about the years she and her husband spent on Mark Island: Winter Harbor and Our Island Lighthouse. In each life there are but a handful of great moments and I knew this was one of mine. I could not look hard enough or deep enough. I was dreaming of something I had lived, or living something I had dreamed. . . .
No matter how often I looked at the rugged shore line and the green of the island where the oil house, the shop, and the boathouse stood, my eyes always came back to trace the outline of the tower and the house. It was the tower I loved most. It stood with its one small window gleaming faintly and its black lantern silhouetted against the green of thickly wooded Turtle Island half a mile beyond. It seemed to me to be standing like a sentinel before our home, watching everything at sea. In the 1950s, the island was bought by Rene Prud’hommeaux, an author of children’s novels, including The Sunken Forest and The Port of Missing Men. 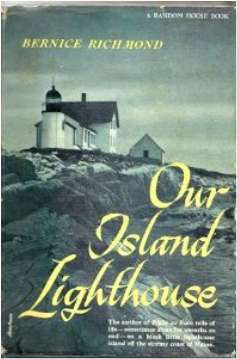 Prud’hommeaux’s wife, Patricia, wrote a children’s book about Mark Island called The Light in the Tower, published in 1957 under the name Joan Howard. The book tells the story of a lighthouse much like the Winter Harbor Light, but in the book the lighthouse is relighted as an aid to navigation thanks to a caring young boy. After the Prud’hommeauxs, the island was owned for a time by the playwright Gerald Kean. William C. Holden III, a financial consultant, writer, and artist, bought the property in 1995, after it had been unused for about a decade. Holden, who wrote several novels while he lived there, renovated the property so that the lighthouse was in its best shape in years. “It was a labor of love, an incredible life experience,” he said. Holden wrote several novels while he lived on Mark Island. Holden sold the property in late 2004. The next owner was Bill Sofield, an interior designer based in New York City. As of summer 2018 the property is again for sale at an asking price of $2.3 million. The lighthouse can be seen distantly from the loop road on Acadia National Park's Schoodic Penninsula. It can also be seen from some of the tour boats leaving Bar Harbor. Frederick P. Gerrish (1856-1861); Nathan Wasgatt (1861-1866); Richard H. Higgins (1866-1868, died in service); Amaziah Southard (1868-1870); Allen H. Cole (1870-1875); James B. Wright (1875-1888); Benjamin Maddox (1888-1896); Adelbert C. Leighton (1896-c.1927); Lester Leighton (1927-1933).